thunder when it lands in the heart of downtown Atlanta at the Georgia World Congress Center. 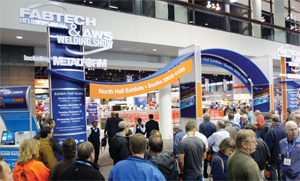 The 3.9 million-sq.-ft. convention center, which has 12 exhibit halls as well as 106 meeting rooms, and ranks among the top five largest convention destinations in the country, will play host to a bevy of new metalforming, fabricating, stamping, welding, finishing and tube and pipe technology. More than 1000 exhibitors and 22,000 attendees are expected to enliven the facility with demonstrations and product displays. New this year is the Finishing Technologies pavilion and conference. Attendees will be able to peruse the latest in liquid paining and powder coating technology, electrocoating, plating, pretreatment and more. Tuesday, November 2, 9:30-10:30 a.m.
Panelists—Roy Verstraete, president and CEO, Anchor Danly; Sam Strausbaugh, managing partner, Defiance Metal Products; Brent Schwartz, VP of engineering, MetoKote Cop. Wednesday, November 3, 9:30-10:30 a.m.
Also make sure to spend time at the Solutions Showcase, where industry experts will lead discussions of critical management-related topics for metalformers and fabricators. On Tuesday morning, November 2, from 11:00 a.m. to noon, two economists very familiar with manufacturing—Dr. Chris Kuehl and Dr. Ken Mayland—will present their perspectives on diversification, from an ROI angle. The session, titled Look Before You Leap—The Economics of Diversification, will offer insights into regulatory issues, costs of entry and other economic factors that impact successful diversification. Also on Tuesday, the Solutions Showcase will feature a presentation from Paul Veryser on the Nuts and Bolts of diversification. And, a session called The Choice to Merge of Acquire, led by Robert Contaldo, managing partner, Corporate Finance Associates, will discuss the thought processes necessary to deciding if your business is ready for expansion through acquisition or merger. On tap at the Solutions Showcase for Wednesday, November 3: The Lean and Green Audit—Step one to Practical Green (11:00 a.m.-noon); Is it Possible to be Lean and Green with your Finishing System (12:30-1:30 p.m.); Converting Factory Lighting: Process and Payback (2:00-3:00 p.m.); and Outlook for Welded Pipe Usage in Natural Gas Shales (3:30-4:30 p.m.). Conference and Professional EventAttendees can take advantage of a worldclass lineup of seminars, conferences, and professional programs offered during the show. Topics include stamping, finishing forming and fabricating, tube and pipe fabrication and welding, as well as operational/management issues. The programming is designed to provide valuable learning experiences for every member of your metalforming operation.View a detailed schedule of some of the key educational sessions beginning on page 24; to download the full educational program, visit www.fabtechexpo.com/e-brochure.cfm. Thursday’s one and only showcase presentation: The Essentials of Job Shop Marketing, 10:00-11:00 a.m. This session will help metalformers get a handle on marketing through websites and tradeshow displays and how to avoid several easy yet fatal mistakes. For a great look at state-of-the-art stamping lines in action, be sure to stop by the booths of Aida and Seyi. The Aida line (booth 1509) will feature a 110-ton gap-frame servo press along with a Coe SpaceMaster compact coil line that unwinds, straightens and feeds. Bachman Machine, St. Louis, MO, will provide tooling for the line while Wintriss will add a SmartPac 2 press automation control. Attendees interested in quick die change technology will be able to spy a magnetic quick-die clamping system supplied by Tecnomagnete, while Pax Products will provide the die-lubrication setup and conveying systems. Lastly, United Aluminum will supply material for the line. At the Seyi booth (#1604), visitors can eyeball a 16-station progressive die (from Great Lakes Metal Stamping) with ball-bearing insertion. The die will run on a low-deflection single-point straightside press also outfitted with a Wintriss SmartPac 2 press control and a Coe feed line. Check out the latest in die protection, as the die will be equipped with six sensors to monitor, among other actions, feed up, part ejection and ball-bearing presence. Also being demonstrated: remote press-line production monitoring. Stamtec (booth 1633) also will have a fully operational line, anchored by a gap-frame press. METALFORM organizer the Precision Metalforming Association also will hold additional events in conjunction with this year’s show, including programs for its Women in Metalforming and Next Gen Leaders groups. For more information, contact Mandy Basel at 216/901-8800, mbasel@pma.org. PMA presents its annual Awards of Excellence in Metalforming program at the event as well, honoring innovators in the areas of productivity, design, quality, product development, process control, safety, and training and education. Please schedule some time to visit the large display on the show floor highlighting the winning companies’ accomplishments.